Brand Development: The analysis and planning of how your brand is perceived in the market. Lead Generation: The initiation of client interest into your services as well as generating referrals. Client Retention: The activities and actions you take to keep in touch with your sphere of influence and clients. The goal of client retention is to help your brand retain as many customers as possible through carefully targeted campaigns. Today’s technologies help you increase repeat business and emphasize maintaining ongoing relationships with current customers. An Online Presence: Simply defined as any business that can be found via an online search, via a website or social media. The most successful real estate brands know the value of a responsive website and social media marketing. Consistent blogging of relevant and useful information is considered one of the best ways to find a wider audience and encourage customer loyalty. 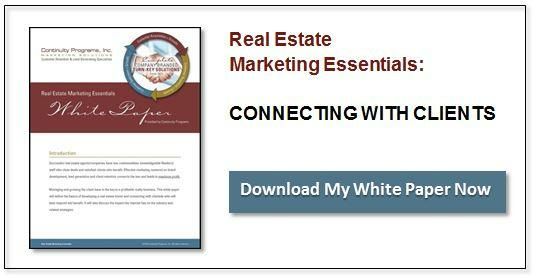 Growing your real estate business requires a solid marketing plan. It’s never been more important to know what you hope to achieve – and how to best develop a plan to achieve it. 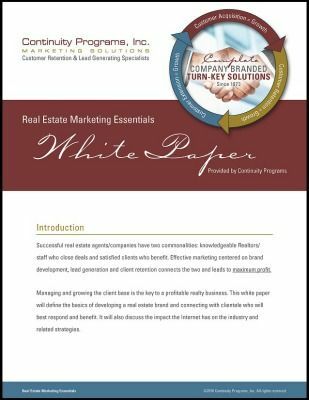 This white paper will help you build an effective real estate marketing strategy, increase your presence in a crowded online world, and strengthen your overall marketing plan.